At the Boston Children’s Museum, our two activities for kids are a crab touch tank and fishing (real fishing and a felt fishing game for the very little ones). So, as of right now, not much. Monday, Tuesday, and parts of Wednesday were slow this week. The amount of people we see is affected by a) how many people are coming to the museum and b) how hot is it outside. This Monday this week was brutal in terms of heat (wear sunscreen, kids) and Tuesday was slow. Wednesday picked up (hey, we caught a fish! ), but that still left a lot of down time to think about different activities. So I brainstormed. My main thoughts this week have included: how can I make this even more interesting for kids? 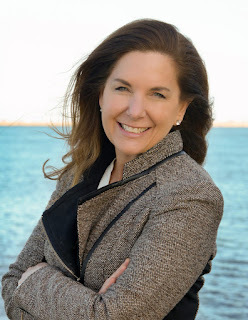 How can I make learning fun? What will they want to learn? And I came up with some plausible ideas that I hope to implement soon. 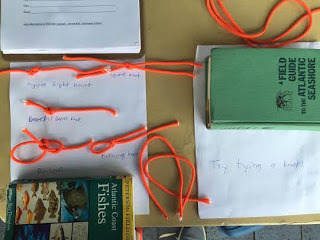 My ideas are knot tying and fish trivia. I’ve done several years of sailing camp, and one thing I got fairly good ad was tying knots. We had a length of orange rope we had cut pieces from to tie a sign up, so I thought why knot use it to teach kids about knots? (I’ll leave now.) Anyways, I have several different types of knots set up for kids to look at. Figure eight knot, double figure eight knot, square knot with one and two strings, barrel knot, and a few more. I’m considering adding a few more, but for now it seems to be working. 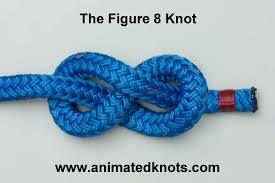 Figure eight knots are by far the most popular, and they’re fairly easy to teach. Crab and fish trivia is my other idea. I’ve still trying to figure out the questions and possibly prizes (stickers and/or stamps are the most likely ideas right now). Hopefully how it will work is there will be five to ten questions. You need to answer a certain amount correctly to win, but you can take the test several times. All the questions will be based on things we teach kids (how do you tell the difference between a girl crab and a boy crab, for example). Part of the goal will be to get the kids to ask questions about marine life and fishing. Hopefully the prize of a stamp or sticker will get them to ask questions and learn a thing or two about fishing. It’s still a work in progress, but I think it has some potential. Part of my favorite thing about working at Save the Harbor Save the Bay is how I can be creative and think of different ways to get kids involved in learning. Something that took me a little while to learn was that if I am interested in something, I will learn everything I possibly can about it. And if something is fun or engaging, I’m going to remember what I learn. I want kids to walk away remembering how to tell the different between a girl and a boy crab, how to tie a figure eight knot, not forget it as soon as they walk into the museum or leave. I want to teach them, and have them remember it.